Spring. Meteorologically, it began March 1st. When Storm Emma came into town. After a weekend of thick snow, it felt like spring was never going to get here. The little note, 'spring begins', printed on the calendar under March 20th has felt like a joke. Especially with a new flurry of snow joining us just two days ago. But, in between those two and a half weeks, it really did feel as though it was on its way. The sunlight had been getting warmer - no longer small, white and blinding, but pleasant and golden; invigorating. My enthusiasm was spiking, I felt immensely motivated and so excited to get to work on my book every day - I usually do my best work in the spring, and as my writing had increased by 250% last week alone, it doesn't seem to be any different this year despite its somewhat late start. My only issue is the lack of leaves on the trees, but I know that, in a few days' time, it will feel just like it should. I will also admit that part of my zeal is for Easter. I am not remotely religious, so for me, it's always been about chocolate and baby animals. It remains no different today. Except that I don't groom a plush rabbit toy and leave it out beside an empty basket on the Saturday night. Usually. Naturally, I had to mark the occasion and try to help usher it in - spring, baby animals, Easter - with a porridge. Because that's just how I roll. And as I've been a little bit obsessed with duck egg blue, I decided that there was nothing better! The only issue was going to be a natural colouring - but it turned out not to be an issue at all. I still had some butterfly pea flower powder in my cupboard from previous experiments, including my naturally coloured blue string pudding, so I figured that mixing that with matcha would yield the desired results. Well, I played around with quantities - 1/2 tsp of pea flower and 1/4 matcha was way too blue, and flipping it was, unsurprisingly, too green. So I tried exactly half and half. The confusion came from butterfly pea flower being quite light and matcha being quite dominating when used in porridges, so the first result surprised me. The second, not so much. The third I found a little odd, but if half and half worked, so be it! 1/4 tsp of each! Butterfly pea flower isn't hard to find as it's drank as a tea in Southeast Asia and used as a natural colouring in dishes like kuih ketan and nyonya chang. It looks a bit gritty and hella dark in colour, but it really does come out to be very light once soaked into oats or rice. Or pear. Having said all this, I've been unable to find it anywhere but Ebay, but even so, that's where I source it and it's all worked out so far. And like any food colouring, you need very little of it, too, so a 10g pouch goes a very long way. 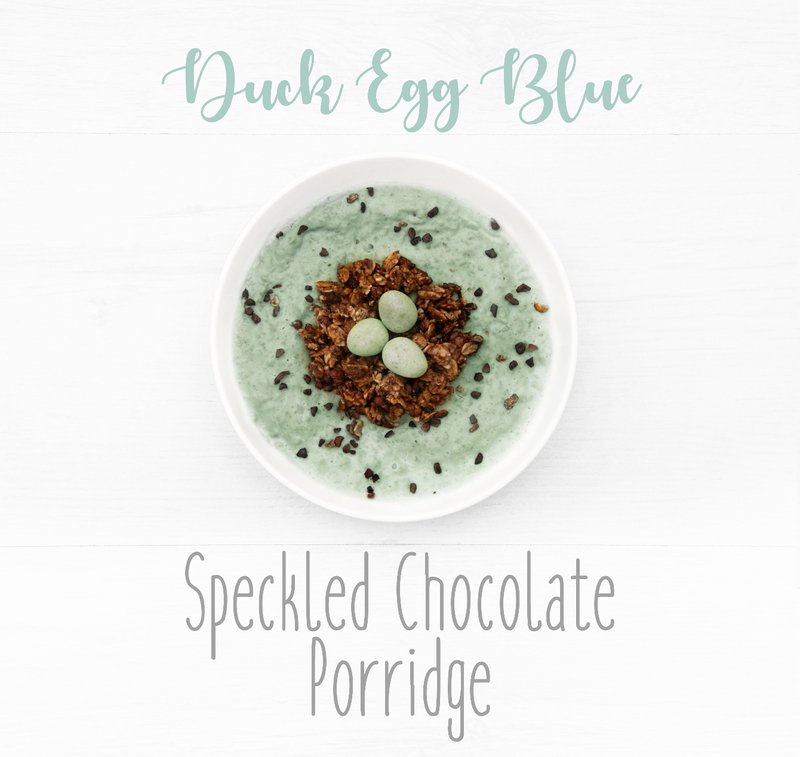 This speckled duck egg porridge uses no duck eggs at all - but if you prefer egg white oats, feel free to adapt this recipe to suit your tastes. I typically use whey for my protein porridge hit, but it's totally adaptable. This recipe is for both overnight or cooked oats. 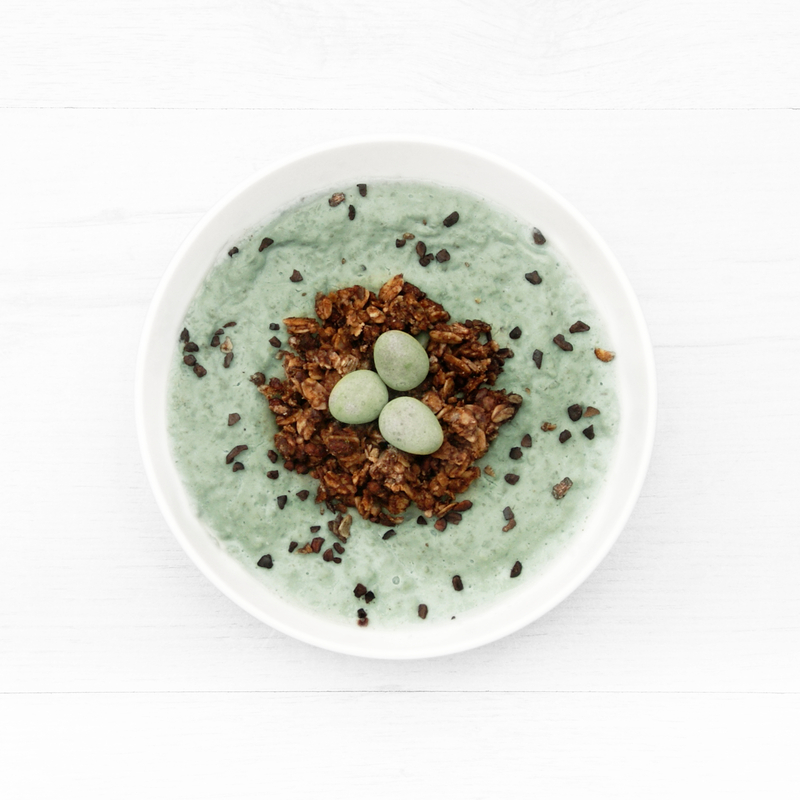 The porridge is white chocolate, flecked with cacao nib 'speckles', and topped with a nest of crumbled chocolate flapjack (or half a Graze protein bite) and 3 mini eggs. 1. Combine the matcha and butterfly pea flower in a bowl and mix, then add your mini eggs (see notes). Mix them around so they're covered and set the eggs to one side. 2. Chop or grate the white chocolate into a bowl (or shaker bottle) and add the matcha-flower mixture, oats, whey and your sweetener of choice, if any. 3. Add the milk. Stir (or shake) to combine (then pour into a bowl or jar). 4. Stir in the chopped cacao nibs (see notes). 5. Leave overnight in the fridge. 6. The colour will have darkened overnight, but it lightens significantly when heated. Heat, if desired, with 50ml added water. Heat up in the microwave or on the hob to melt the chocolate and lighten the colour. 7. Transfer into a bowl and sprinkle the chopped cacao nibs, then sprinkle half a Graze chocolate protein bite (or chocolate flapjack) into the centre to form the nest and put the eggs on top. Nom away. 1. As above, combine the matcha and butterfly pea flower in a bowl and mix, then add your mini eggs (see notes). Mix them around so they're covered and set the eggs to one side. 3. Grate or chop the white chocolate into a pan and add the matcha-flower mixture, oats, whey and your sweetener of choice, if any, and mix together. 4. Add the milk, stirring all the while to combine, then add the boiled water. 5. Heat over medium and bring to a boil, then lower to a simmer for 20 minutes to thicken. 6. Transfer to a bowl and sprinkle cacao nibs, then crumble the flapjack into the centre to build the nest, then add the mini eggs. Nom away. • I used three white Cadbury mini eggs first, but the butterfly pea flower doesn't act as a powder so only the matcha transferred. I took the white away and used purple eggs instead which worked much better. • I used a food dicer/electric chopper to chop the cacao nibs into smaller pieces; I chopped 5g of cacao nibs, but only actually used half. I've used the nutrition from the full 5g of cacao nibs in the nutritional profile below. World Book Day - Book Giveaway & Sale!